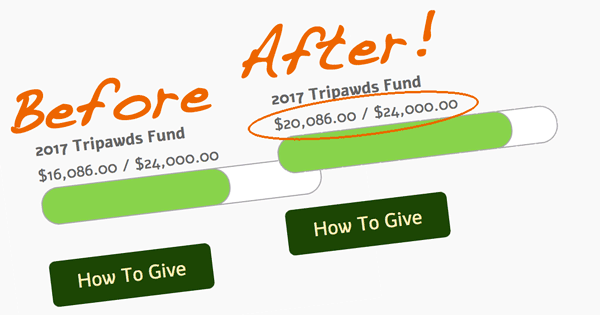 Anypawdy following along at home may have noticed a big jump this week in the progress of the status bar for the 2017 Tripawds Fund. 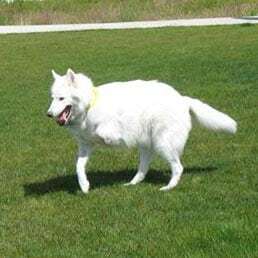 The Tripawds Comunity owes a huge debt of gratitude to a long time supporter who just donated $4,000 to help the Tripawds Foundation reach its 2017 fundraising goal. In addition, nine more generous contributors donated another $1500+ over just the past ten days. We also sincerely appreciate the numerous smaller donations that have been rolling in this month. No amount goes unnoticed here, and every contributor gets a special tribute on the Tripawds Honor Roll. Please be sure to submit yours if you have not yet done so! For now, we are keeping this major contribution confidential while we coordinate logistics for allocation of funds and acknowledgement of this amazing gift. This amount may help us launch a new support effort, or we may expand current assistance programs to help amputee pets and their people everywhere! Either way, we will be posting additional details soon. Regardless, this means we are that much closer to reaching the fundraising goal. With just a couple weeks left in the year, you still have time to help! Join fellow members and fans and pay tribute to your three legged heroes and angels on the with a charitable contribution of any amount. And to the generous Souls who gave so generously, whatever the amount, THANK YOU for helping to keep this priceless site up and running! !